Poirier, Lucien and Susan Spier. "Auditorium de Québec/Le Capitole". The Canadian Encyclopedia, 15 December 2013, Historica Canada. https://www.thecanadianencyclopedia.ca/en/article/auditorium-de-quebecle-capitole-emc. Accessed 23 April 2019. Auditorium de Québec (from 1930 Le Capitol and from 1992 Le Capitole de Québec). Designed by the US architect Walter S. Painter and built 1902-4 at 972 St-Jean St, Quebec City, on the initiative of the mayor, S.N. Parent. Of eclectic style, but referred to by architects as in the beaux-arts tradition, it was considered at the time to be "the most perfect of its kind." The amphitheatre measured 23 by 27 m and could hold more than 1600 spectators, while the stage had a surface area of 220.5 square m. The hall was inaugurated 31 Aug and 1 Sep 1903 by two concerts featuring the Société symphonique de Québec conducted by Joseph Vézina with a choir and a team of soloists which included Rosario Bourdon, Paul Dufault, Bernadette Dufresne, J.-A. Gilbert, Georges Hasneier [Haseneier], Eileen Millett, Émiliano Renaud, and Joseph Saucier. The management of the building initially was entrusted to professional administrators, whose program, dictated by too great a concern for profit, favoured foreign artists over opera and concert performances organized by local citizens. Some 20 years later, Nazaire LeVasseur was to draw up a gloomy balance-sheet of artistic life in the capital, stating that theatre in Quebec City, "starting with the Auditorium, had become... a means of financial exploitation, totally devoid of skill, knowledge, and moral teaching." In 1927 the architect H. Laberge remodelled the auditorium, and a 64-stop Casavant organ was installed. A second mortgage was required to cover the cost of the renovations; this was guaranteed by the Famous Players film distribution company which changed the Auditorium's name to the Capitol Theatre (Quebec City). In 1935, the architect Raoul Chenevert made further modifications: the theatre was transformed into a cinema and part of the building was converted into offices. 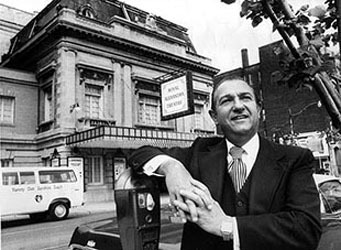 After having been the property of United Cinema, a Quebec subsidiary of Famous Players, the Auditorium, abandoned in 1982, was given the status of historical monument in 1984. A Capitol Theatre collection, comprising a few artists' photographs, is held at the ANQ (now the BAnQ) in Quebec City. From the 1950s until 1971, when the Capitol Theatre became mainly a cinema, the auditorium had been, as Claude Paulette has stated, 'host to all the principal manifestations of Quebec life'. Besides the debuts of the Opéra français de Québec and the Théâtre lyrique de Nouvelle-France, it has presented performances by itinerant theatre companies, Canadian and foreign dance troupes, the TS, the MSO, and symphony orchestras from the USA and Europe. The Quebec Symphony Orchestra has performed gala soirées in it, as well as concerts for young people and symphony matinées. The orchestra also performed there in the 1975-6 season during a strike by employees of Quebec City's Grand Théâtre. Many solo recitals have been presented at the auditorium in the Soirées classiques, the Grands Classiques, and other such series, on the initiative of the Quebec impresarios Arthur Lavigne, J.-Albert Gauvin, and Émile Caouette. Among the distinguished recitalists have been Leopold Godowsky, Marcel Grandjany, Ernestine Schumann-Heink, Witold Malcuzynski, Ovide Musin, Ronald Turini, and Eugène Ysaÿe. For some ten years the hall remained dark and abandoned, but in 1992 with $12 million from Quebec's public and private sectors, it reopened as Le Théâtre Capitole de Québec at the original address on rue St Jean, restored to its former glory. The inauguration was a gala affair on November 21, 1992, attended by 1,360 spectators hosted by Rémy Girard and Marc-André Coalier with performances by the QSO under Gilles Ouellet, and featuring Céline Dion, Robert Charlebois, Julie Masse, Patrick Bruel, Renée Martel and others. Also present were René and Natalie Simard, Alys Robi and Mario Pelchat. The theatre is part of the Le Capitole de Québec Complex that boasts a hotel, a restaurant, and a cabaret theatre. It has won Canadian and US architectural honours for respecting the original quality and historical design of its renovations and new additions. Designed in décor of times gone by with a guilded staircase and balustrades, the theatre seats 1106, 567 on the ground floor and 539 in the balcony. It has all the accoutrements of a modern hall including an orchestra pit, a wooden stage floor with linoleum and 48 prefab sections to accommodate dancers, a burgundy velvet curtain, rigging points, a fly system with hydraulic dual hoist bars, TV and recording facilities, and a fog machine. Among artists who have appeared at Le Capitole are Laurence Jalbert, Roch Voisine and Jean-Pierre Ferland. The smaller Le Cabaret du Capitole theatre can seat 565. Beginning in 1995 Le Capitole Productions (LCQ) has presented a variety of high calibre "Made in Quebec" shows and musicals for local and international markets.